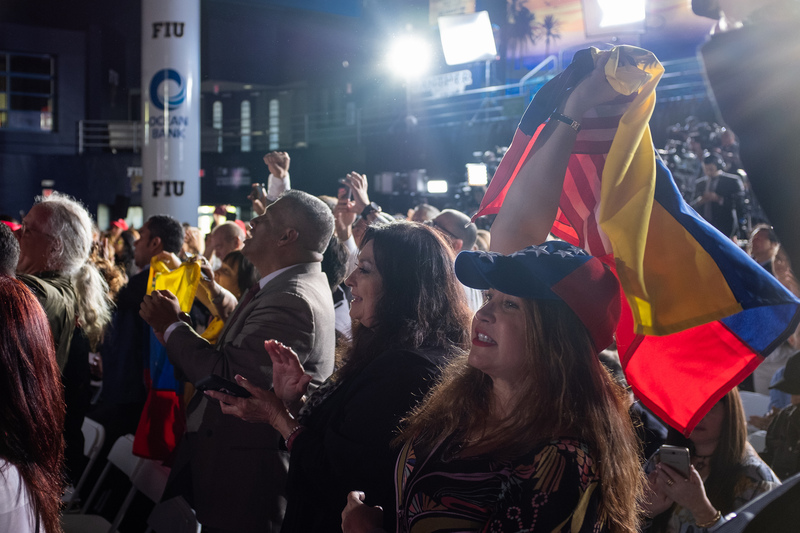 President Donald Trump visited FIU in February to condemn the humanitarian crisis in Venezuela and make clear his support for its desperate people. The message resonated with the 1,500-strong audience at the Ocean Bank Convocation Center and gave hope to the assembled immigrants and their adult children who have seen firsthand how government corruption, economic mismanagement and political turmoil can have devastating consequences. News coming from the South American country could hardly be worse. Under authoritarian leader Nicolas Maduro, whom Trump and heads of state around the world have demanded step down, inflation is running at 80,000 percent annually; chronic shortages of food and medicine grow unabated; infant and maternal mortality rates have escalated by 30 and 65 percent, respectively; and an estimated 10 percent of citizens—3 million people—have fled in the last four years alone. At FIU, students and employees from Venezuela are doing whatever they can for their broken country. Dietetics professor Cristina Palacios made the decision to leave her already-declining native land more than a decade ago, first teaching in Puerto Rico before arriving at FIU a year and a half ago. 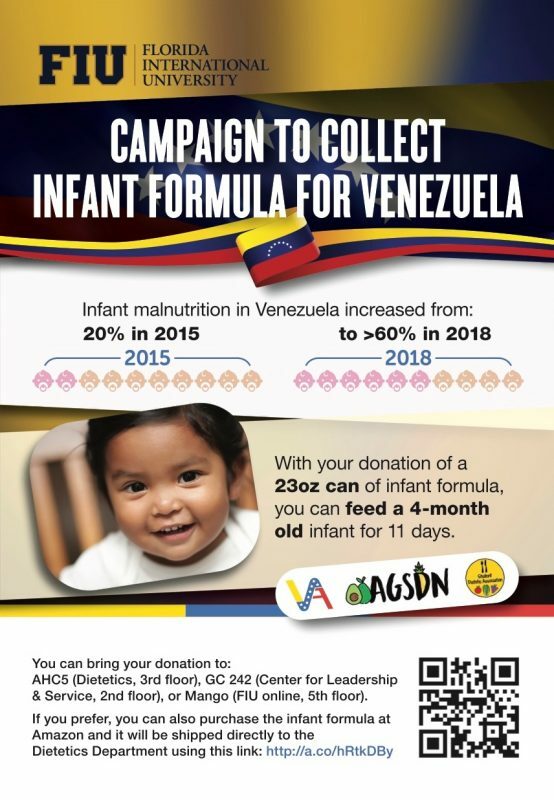 While she had kept up with her former professors and colleagues, she was nonetheless unprepared for the horrific data on infant malnutrition delivered by Venezuelan nutritionists in November at a conference in Mexico. Palacios mobilized dietetics students within the Stempel College of Public Health & Social Work as well as others to collect baby formula, all of which landed in her campus office. The first boxes were shipped in March through a Miami nonprofit that sends supplies discreetly so as not to draw the attention of government officials. Julio Leon Penate graduated from high school in Venezuela in 2014, during a period of growing civil unrest, and out of his parents’ concern for his future went to live with an aunt and cousins in Miami. He found a welcoming community at FIU and soon connected with the Venezuelan Student Alliance, which caters to the social and cultural needs of the more than 1,900 students who identify as Venezuelan. In recent months, the organization has pivoted from its original mission to instead collaborate with others on fundraising efforts—such as a soccer tournament held during the spring semester—that generate income for projects back home. Alumnus Christian Bottome, who earned a civil engineering degree in December, is president of the American Association of Venezuelan Engineers, founded at FIU and now counting nearly 200 members. While the group initially formed to encourage students’ academic growth and foster community, lately it has taken up more-pressing activity. “It’s been impossible for us to see what’s happening in Venezuela and not try to contribute in any way we can, which is what we have been doing 90 percent of the time,” says Bottome, who in 2015 cut short his university studies in Caracas as conditions degraded. Today he is a project engineer with a construction firm headquartered in Pompano Beach. The engineering association set up a fundraising account earlier this year that collects donations in support of its clean-water initiatives. Nationwide power outages and spotty electrical service have made water treatment systems unreliable, Bottome explains, and the association members have prioritized access to the resource. 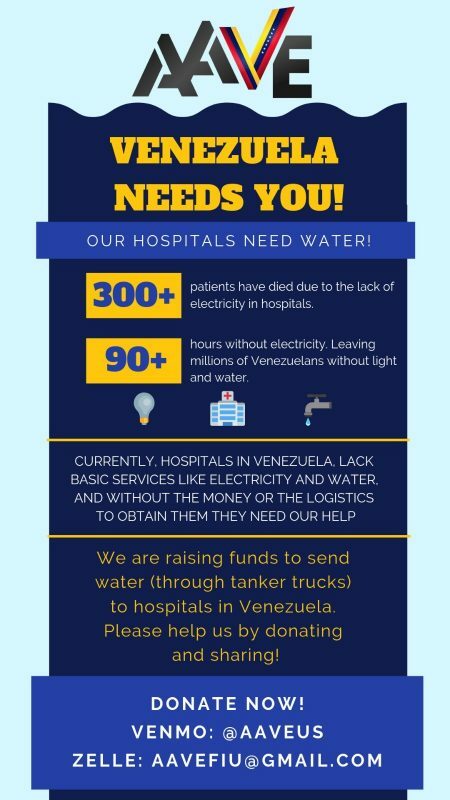 In March, Bottome reached out to his contacts in Venezuela—among them the founder of the volunteer Green Cross medical brigade—to hire cistern trucks and other vehicles to deliver water to a hospital and charities catering to children. The association members are now working with three FIU professors from Venezuela on a two-pronged plan: to provide bucket-style water filters to households and to secure gravity-based technology that will allow partners on the ground to establish water purifying centers at selected locations throughout the country. The same Venezuelan students so concerned about others back home—where many jobs have dried up and families increasingly rely on remittances from loved ones abroad—face their own challenge upon graduating: find a job within 90 days or leave the United States. As international status poses a hurdle in the hiring process—would-be employers must go through extra hoops—leaders of the engineering association have taken creative steps to boost members’ attractiveness beyond their solid FIU degrees. One example: They recently arranged for tailored instruction through the Moss School of Construction so students could earn a certification that would add value to their resumes. Others too are lending a hand to the Venezuelan engineering students. The Cuban American Association of Civil Engineers, a 58-year-old professional organization based in Miami, in March invited 11 soon-to-graduate seniors to its annual gala to network with its members. Event organizers told the hundreds of assembled attendees about the plight of the Venezuelans, and on that very night the principals of two firms pledged outright to hire them all or otherwise find them work through connections at other companies. Lazaro Russet is president of the Cuban engineering association’s student chapter at FIU. The Cuban-born civil engineering major shares concern for his peers as they try to build lives for themselves at such a precarious time, and he empathized with them over the catastrophic state of their homeland.